When I tried to log in to facebook today I saw an error message that read “Account Temporarily Unavailable.” This is the first time it occurred to me so I indulged myself in an investigation and found this link. This site shows frequently updated reports on the service status of important sites based on user reports at the site itself, user reports on twitter and feeds and official announcements. It shows a nifty little chart that depicts the status activity of selected services over the last 24 hours. 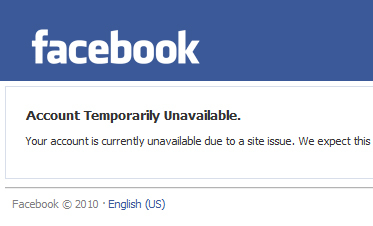 According to which, facebook has been suffering from widespread disruption on and off throughout the last 24 hours.